Several students didn’t believe the energy skate park simulation that, without friction, the skater always returns to the same height even if the U shaped track is asymmetric (has a different steepness on each side). So I set up an impromptu real life version using 2 dynamics tracks of different lengths. Kids were impressed. Started pie charts today. Used these toys to develop progression from identifying energy stored by object to the need for naming the different flavors of energy. 1. 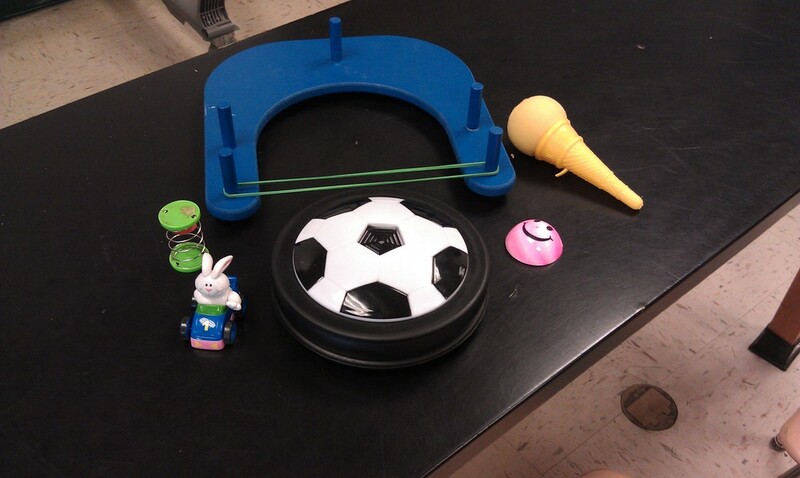 Hoverpuck and launcher: Energy stored in rubber band –> energy stored in puck. Need for flavors. Introduce elastic and kinetic. Redo #1 and #2 in terms of elastic and kinetic. Elastic energy stored in rubberband –> kinetic energy stored in puck. Elastic energy stored in car –> kinetic energy stored in car. 3. Pop-up toys (popper, spring jumper, ice cream shooter): elastic energy stored in toy–> kinetic energy stored in toy –> ??? Need for gravitational energy. Contrast with using these toys in space (elastic to kinetic only). Kinetic energy decreases bc of earth's gravitational pull. 4. Hoverpuck (off, slides with friction) and launcher: Elastic in rubber band to kinetic in puck to ??? Introduce thermal energy… Video of infrared camera showing bike stopping on concrete. Demo showing diffusion of dye in cold vs hot water. PhET friction applet. Thermal energy = microscopic kinetic energy. Elastic energy stored in puck –> kinetic energy stored in puck –> (delta) thermal stored in puck and table. After yesterday's experiments, I decided we should have decided upon a standard unit for energy. In this case, a standard rubberband pulled back some distance stores 1 unit of energy. 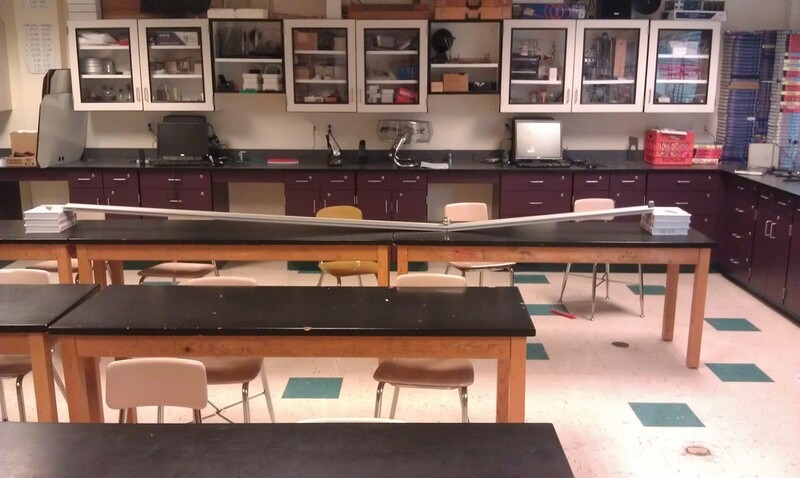 Need to test how much energy a cart has? Send it into a rubber and see how far it stretches. I know this isn't perfect, but we aren't developing quantitative relationships now. 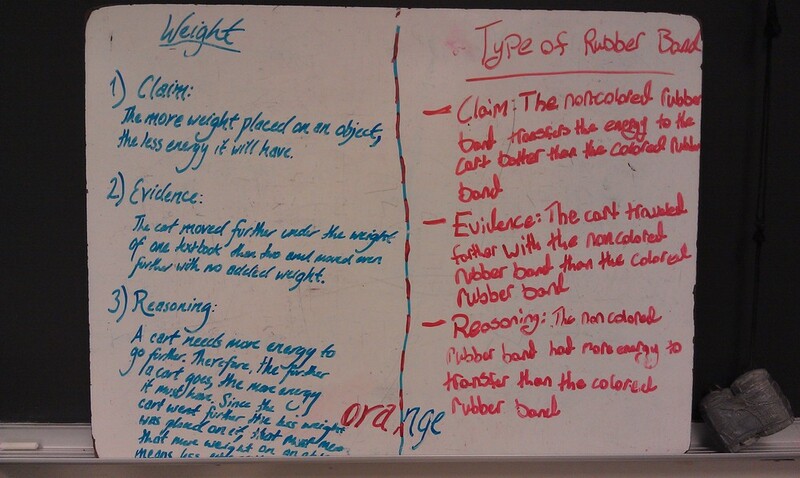 Just trying to get at the factors which affect the amount of energy in moving carts and stretched rubberbands. Looks like we’ve got some work to do regarding: (1) Controlled experiments; (2) Conservation of energy ; (3) Writing scientific explanations in “claim-evidence-reasoning” format. 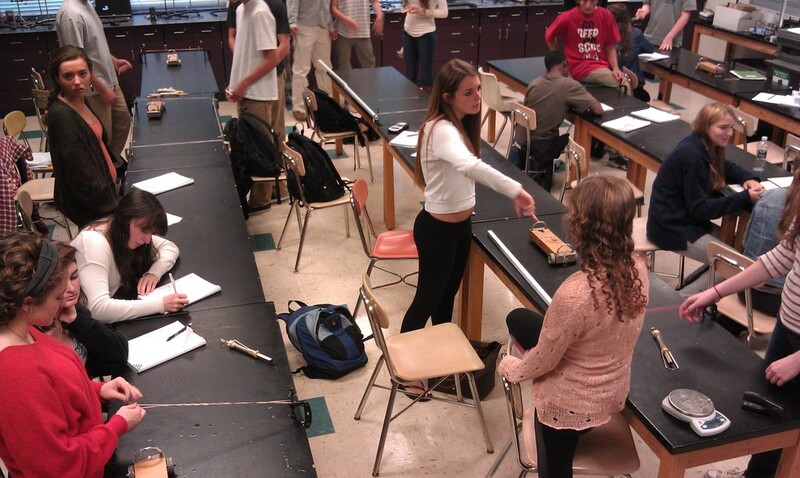 College-prep students using carts and rubber bands to design their own qualitative energy experiments. The focus is "What factors determine the amount of energy stored in a moving cart? In a stretched rubber band?" In pre-lab, we brainstormed possible factors, then I assigned each group one cart factor and one rubber band factor to investigate (with some overlap among groups for consensus purposes). 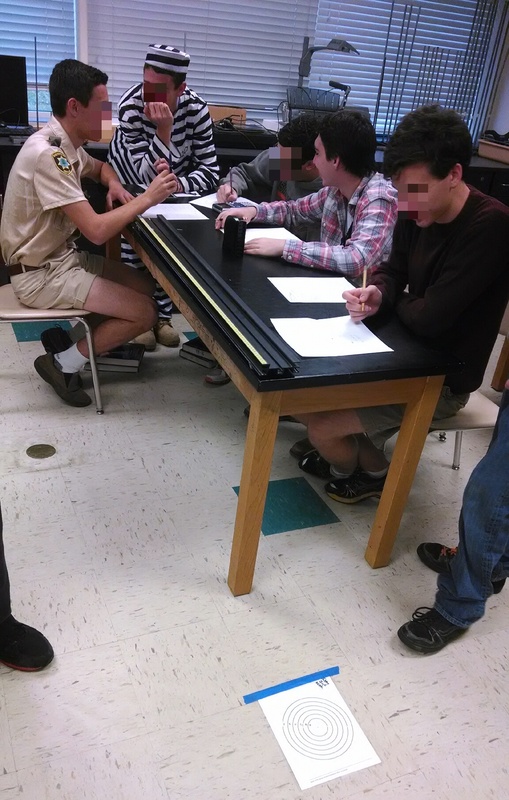 I forgot how painful it can be watching students design their own experiments. I might even have them do it over again, but with more guidance from me.